Tbilisi City Hall Infrastructure Development Municipal Service will implement several large-scale projects in 2019-2020. Presentation of Infrastructure Projects was held today by Kakha Kaladze. As the Mayor of Tbilisi noted, the City Hall of the City begins to arrange a new road connecting Machavariani Street and Marshal Gelovani Avenue , cost of which is 18 million GEL. “The area surrounding the Lisi Lake is quite evolving. Therefore, the infrastructure in the surrounding area is very important. As a result of the implementation of the project, we will have a completely new road, the tender will be announced very soon. The works will be completed by the end of 2019, “said Kakha Kaladze. Also, be Dighomi area a new urban park , with a value of 11 620 192 GEL. The works will be completed in 2020. “Next is a very important project in Dighomi territory has been settled. We talk very much about environmental improvement on what to do with the municipality and the population, in order to rectify the current situation. Certain regulations have been introduced, the approach Besides the construction. Also, pay attention to the green ivrtseebis set. None of the construction permits have been issued on our side by green spaces, sports grounds, etc. Very much attention is paid to creating a lot of green space, cautious and reconstructing existing spaces. The general plan also states that it is necessary to build city parks. There is already a project of the arrangement of the park in the territory of Dighomi municipalities and in the nearest future we will announce the expression of interest on the construction, “said Tbilisi Mayor. This year, the projects to be implemented, in Tbilisi sewerage networks of the first phase of work is included in the cost of 3 000 000; In 2019, construction of the sewage network will be carried out on Mukhiani settlements. The cost of the project is 1 900 000 GEL. “Digomi village is a very difficult situation because there is no network of walnuts. Last year we started implementing this project, which is divided into several stages. We have the same situation on Mukhiani cottages where there is no road infrastructure that will not be implemented until this project will be implemented, “- said the Mayor of Tbilisi. Municipal Infrastructure Department in 2019 “Radisson” hotel near the tunnel will carry out rehabilitation , with a budget of 2 million. 1.3 million will be spent on rehabilitation of the underground motorway passage near the metro station “Rustaveli”. As for the Kakheti highway rehabilitation , the current in the area of infrastructure – 45 000 000, the outdoor lighting network – 7 000 000, while the green spaces arrangements – 7 085 489 will be spent; monument – “people of the sun” in the surrounding area of the rehabilitation cost of 3 553 970 GEL. This project will be implemented this year. “This is a strategic path that is in a very difficult situation. At the first stage, we started to adjust the right and left spare strips. All communication networks have already been changed. There will be a large scale work in which the green cover and lighting network will be fully renovated. As for the surrounding area of ​​the monument, we have a similar approach – green spaces are created. Within the works, irrigation system, lighting, artificial lake will be created and in the end there will be quite a nice space in the city, “- said the Mayor of Tbilisi. It is also planned to rehabilitate Chavchavadze avenue (13 000 000 GEL), Vekua-Khizanishvili (10 000 000 GEL) and Kandelaki (1 600 000 GEL). “Rehabilitation of Chavchavadze avenue is also underway in the direction of underground communications, in the framework of rehabilitation, road infrastructure, as well as underground communications and outdoor lighting system, we plan to create a special line for buses to provide public transport in the city To move quickly and comfortably, “said Tbilisi Mayor. The rehabilitation of Veterans, Rest and Culture Park (Kikvidze) will also be implemented in 2019 , the cost of which is 4 900 000 GEL. “Within the works, the park will be fully rehabilitated, new spaces will be created for children, amphitheater and bicycle will be arranged, and all other city parks will be arranged in the sports zone – the trainers will be able to enjoy any people of any age,” said Kakha Kaladze. Gldani district, Chavchavadze Avenue, River Gldanula the reconstruction of the bridges, in the current year 4 000 000 will be spent. Another project, the implementation of which is planned for the current year, the University Street and Tskneti highway (bugs) connecting the bridge construction, which cost about 20-30 million. “This is a two-year project. Everybody knows the pedestrian bridge, which was rehabilitated last year. This project will be carried out in the vicinity of which will facilitate the movement of vehicles from the Bagebi to Saburtalo and will lift the situation in general, “said Tbilisi Mayor. In 2019-2020, construction of multifunctional public centers will be constructed at Didi Dighomi (12 000 000 GEL) and Varketili (12 000 000 GEL). “These are multifunctional centers where all kinds of sport, swimming pool, mediatek, cafes and libraries will be added, and we will present similar projects in different regions, which will be implemented next year,” said Kakha Kaladze. Construction of Vashlijvari road is also planned, which cost 2 700 000 GEL. Kakha Kaladze River and Saarbrucken area adjacent to the area of the rehabilitation project, he talked about the value of which 9 900 000 GEL. “We are planning to rehabilitate the surrounding area, including the Dedaena Garden. We want the situation to be maximally regulated. Green spaces, which are in poor condition in the mother’s garden, need care and care. In this area of ​​interest, interest is quite large. Besides, the complete rehabilitation of the Orbeliani square will be completed in the nearest future and it will be in harmony with each other, “- said Kakha Kaladze. Rehabilitation of Pirosmani (50 000 000 GEL) and Gudiashvili-Purtseladze (45 000 000 GEL) will be rehabilitated in 2019-2020 years. “Pirosmani street rehabilitation rather large project, which two years will continue. In the streets of all the house was in poor condition. Within the project, it’s all arranged. Here, too, a similar approach. Underground communications, to the current situation as a whole want to fix it and correct it” – said Mayor a.
Gorgasali Street, along the Kura River in the area of regulation , in the current year 110 000 000 will be spent. “We want to arrange the road tunnel and above the tunnel, the green space, which will be designed for pedestrians only, about 10 hectares of area will be greened and arranged, and we want to construct a pedestrian bridge that will move directly to the metro station” Avlabar ” “Said Tbilisi Mayor. 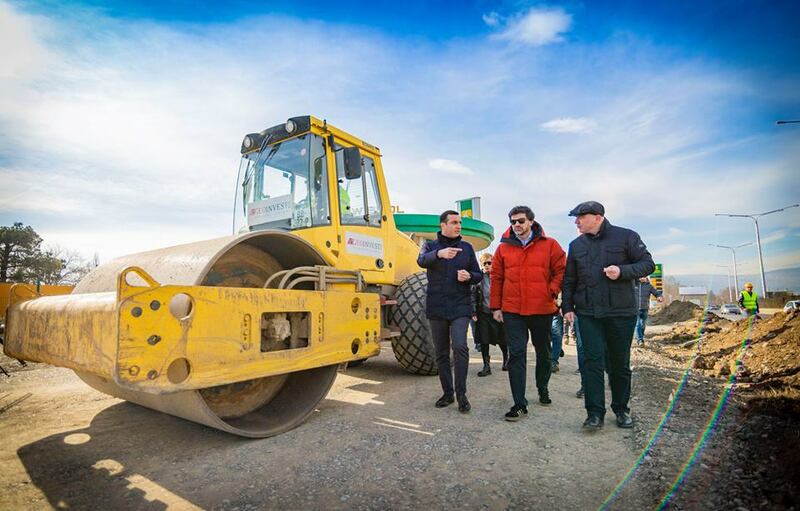 Chairman of the Parliament Irakli Kobakhidze, Chairman of the City Council Giorgi Tkemaladze, Deputy Mayors, Sakrebulo and MPs, Business and Society representatives attended the presentation of large-scale projects.